In the last two weeks, the NBA has made a series of groundbreaking moves. First, in mid-July, the Los Angeles Clippers hired Natalie Nakase as an assistant coach for their summer league team. 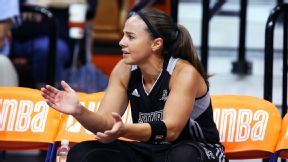 Then on Tuesday, the San Antonio Spurs announced they had hired WNBA star Becky Hammon as an assistant coach, making her the first woman to join an NBA coaching staff full time. Between those two events, the NBA players' association did something no major sports union had done before: name a woman as executive director. In the fall, Michele Roberts will officially begin her role as union chief. (She was voted in by NBA players.) The attorney, also a native New Yorker, talked with espnW this week. espnW: How much have you thought about the landmark nature of this position for women? Roberts: I didn't think about it at all at the time I was applying. You're aware it will be a question your interviewers will likely have, so I was prepared to engage in that discussion. But apart from knowing it would be the pink elephant in the room, I didn't allow myself to think it was a disadvantage. Of course, I'm always aware of the fact I'm a woman, and usually working in a context dominated by men. I try to recognize if it's a problem and address it up front. espnW: How do you feel about all the discussion around gender, around this being "a first"? Roberts: A tiny bit of me wishes people wouldn't make a big deal of it, but I also recognize that we need to make sure other young women don't feel paralyzed, don't limit themselves because of gender. I didn't meet a female African-American lawyer until my third year of law school -- never met or spoke to one. But that didn't mean I didn't think I could do it. I put blinders on. My advice: Once you latch on to something you know you're passionate about, don't think about the reasons you might not make it. I understand and appreciate how important it is to have a mentor who looks like you, but I also know you can succeed without one. When it's available, it's great, but it shouldn't be a barrier. If that were the case, I would be a grandmother somewhere, instead of the position I'm in now. espnW: You actually left home at age 13 to attend boarding school. What was that experience like? Roberts: That was my first time in life being surrounded entirely by white people. And that was also the first time these girls had been around someone of color. That was the most difficult time for me, personally, especially because I was so young. When you're somewhat stereotyped, you have to have maturity and confidence to not allow that to paralyze you. When I was in high school, that was the first time that I sensed that people thought I was inferior. I had always been the best student, and suddenly people were doubting me. But I just did what my mother told me to do: Study hard, do your work, don't worry about that crap, you're not there for that. 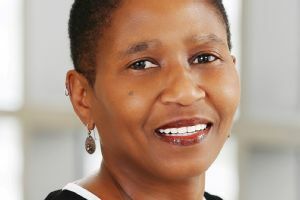 "There is a kinship there, which I felt for a long time with the players," says Michele Roberts, the new head of the NBA players' union. "They could have been my brothers." espnW: Do you think, in a way, who you are and your background helps you connect with the NBA players? Roberts: Yes, I do. A lot of them come from intact middle class families and they had reasons to believe in their potential success. But a number come from backgrounds similar to my own. I grew up poor, single mom, all public assistance. If anyone was going to bet on my success, the easy money would have been on "She will be a failure." That background is something I share with a good number of the players. I love the game, but I've always loved the players, too. Their stories touch me because they're much like my own. I've said this to them: When people refer to NBA players as "thugs" and "spoiled millionaires" who have no morals, it made me angry, because I knew how hard they worked to get where they are. And they need a champion who is tough and not at all afraid to go up against the powers that be. I'm there, I got it -- let's do it. There is a kinship there, which I felt for a long time with the players. They could have been my brothers. espnW: What do you think it is about the game, or about the NBA, that has allowed the sport to be so progressive? Roberts: That's a good question. I'm just happy I picked the right sport. It has been suggested to me that this wouldn't have happened in Major League Baseball. I think the diversity among NBA players certainly helps. There is an inability to push back on diversity in the NBA because of the diversity of the players. On the league side, there are so many women as well. There is still work to do, but give the league credit for this: There are women in significant positions. I'd like to find out exactly why we're doing better than other sports, but I'll credit the game for being on the right side of history.